★★★★☆ Very easy to use. Although I thought the magnet would be a lil bit stronger. So far it does stay on holder, but has a tendency to bounce around note than I would prefer. Sometimes I have to reposition it, do to sliding. Update, I have removed it due to it not working well. The vent mount itself doesn't stay well. 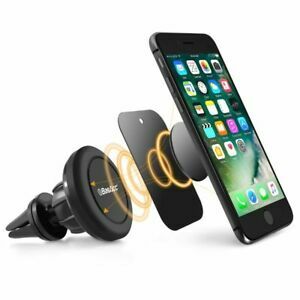 ★☆☆☆☆ Magnets work great just holding phone and holder but don't work when setting phone on holder. Holder cannot support weight of phone so it turns around and slides off. Rubber cover on metal spikes of holder meant to fit in car air vent, split and peeled off leaving exposed metal, first time put in air vent. Will not fit in air vent, will not hold cell phone Maybe a firm base like a dash mount works? This air vent holder is sloppy, poorly designed and badly made. ★★★☆☆ The magnet is awesome and very strong. The mount does not stay on my vents at all. I'm not sure what I'm doing wrong, but when I put my iPhone 6S Plus on the mount, the entire thing falls from the vent. It doesn't stay put and is very loose. ★★★★☆ I love it. Just don't go over a big bump or it will fall off. Just riding here and there it's great just to touch the phone to it and let go and use my speaker. ★★★★★ I like this cellphone car mount. It is somewhat small so I can travel with it. I have bought several to give to others because they are reasonably priced. Overall I think it is very useful.